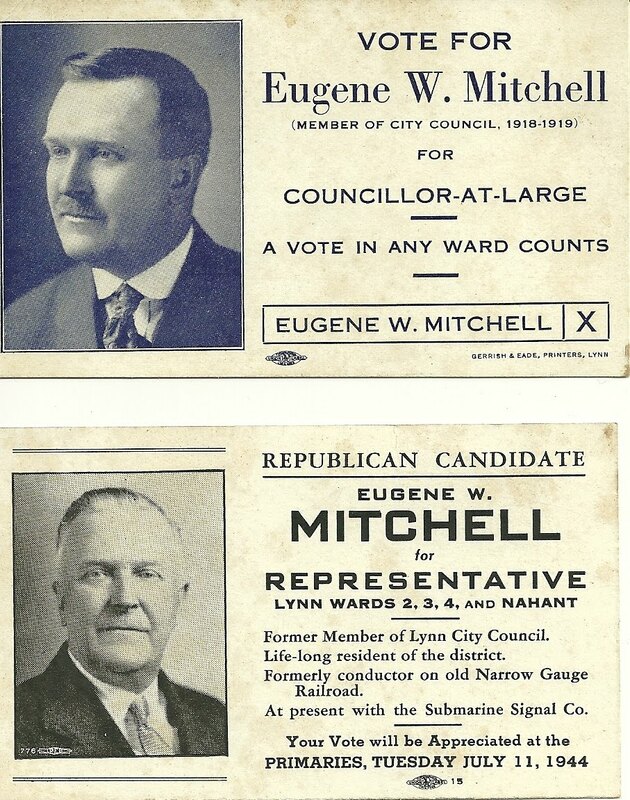 Two political cards for Eugene W. Mitchell of Lynn, Massachusetts. The bottom card is dated 1944. He appears to be 20 years younger in the top card. 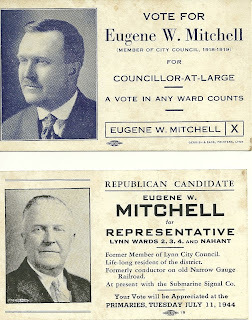 The top card is asking for a vote for Eugene W. Mitchell to the Councillor-at-Large position, in which a vote in any ward counts toward his total. The bottom card represents Eugene W. Mitchell's 1944 run for Representative from Lynn Wards 2, 3 and 4 and Nahant. There's a bit more information on this card. He describes himself as a former member of Lynn City Council; as a life-long resident of the district; as a former conductor n old Narrow Gauge Railroad; as currently employed by Submarine Signal Company. I found Eugene Willard Mitchell in the Censuses enumerated at Lynn, Massachusetts; I also found the record of his World War I Draft Registration Card. The 1880 Census gave Massachusetts as the place of birth of his mother and father, but on the subsequent Censuses, up to 1930, he indicated that his father was born in Maine and his mother, either in Nova Scotia or Canada English. I found some conflicting information on the parents of Eugene Willard Mitchell. The 1880 Census shows parents John and Julia Mitchell with children Eugene and Edith. But the 1900 Census for John and Julia reveal that he was born in Ireland and immigrated in the 1880s, after Eugene W. Mitchell was born. So, definitely, more research needs to be done. I'm interested in the Maine and Nova Scotia possibilities, in the hopes that Eugene's father's family came from Nova Scotia to Maine, as I also have Mitchell ancestors who made their way from Nova Scotia to Maine. If you have any insights to add to the family of Eugene Willard Mitchell, please let me know. Thanks for stopping by!